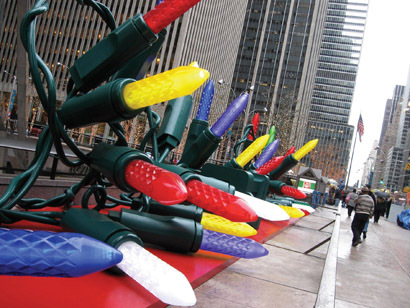 NEW YORK – PRG Scenic Technologies helped American Christmas, which specializes in holiday décor, go green with their display outside the McGraw-Hill building at 1221 6th Avenue. The traditional display has been replaced with an oversized string of 31 LED holiday lights. "We initially pitched the new design to our client, the Rockefeller Group, owners of 1221 6th Avenue," said Lance R. Caffrey, chief production officer, American Christmas. "The Rockefeller Group puts a lot of emphasis on being LEED-certified and being environmentally aware, so as a nod to that, we suggested they change the existing display of conventional holiday lights to a display of LED lights." Caffrey, who worked closely with PRG, leads the manufacturing, logistics and production team of American Christmas. The new display is modeled on M5 Mini Ice Christmas lights. It is 7 1/2 feet tall, 75 feet long and 10 feet deep. The entire structure weighs 6,000 lbs and was built in six sections for transport and storage. Each of the display lamps is internally lit by LED sources. The team experimented with different technologies to achieve the desired luminosity and even distribution of light. "Inside each display, we used a flexible circuit board with LEDs that is backed with an adhesive strip," said Chad Woerner, project manager, PRG. "We used five-meters of LED strip per display and an MR11 LED lamp at the top to get the light into the cone where the bulb comes to a point." Because the display draws only 7 amps, it is left on day and night. "We experimented with effects like chases and blinking, but in the end the design team and the building owners wanted to go for something more traditional," said Woerner. "Working with PRG was a great experience," said Caffrey. "This was something that had never been done before. The scale and the level of detail made it very challenging to take from concept to completion." In recent years, PRG has also provided the automation for the windows at Macy's department store, as well as for an American Christmas-designed chandelier in the lobby of Radio City Music hall that contains 80,000 Swarovski crystals. For more information on PRG, please visit www.prg.com.